13-19 October is the 8th national Get Online Week, inspiring people across the UK to get online and do more with digital skills. 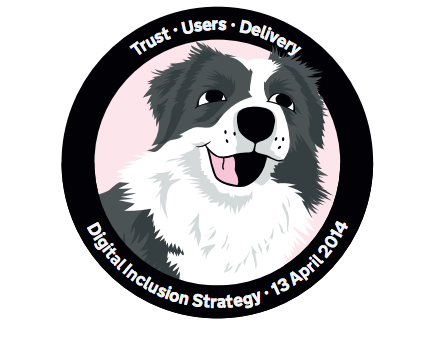 Six months ago, I joined the Digital Inclusion team just as we were about to launch the UK Digital Inclusion Strategy as part of the Government Digital Strategy’s commitment to collaborate with partners across public, private, and voluntary sectors to help people get online. This was an exciting opportunity to bring together a wide range of partners to tackle digital exclusion and to overcome the four barriers that are the main blockers on digital inclusion: lack of motivation, access, skills and trust. The first of those barriers is also the key to the other three. With motivation, most barriers can be overcome. The aim of the strategy is to increase the number of people and organisations online. Our target is a reduction of 25% in the number of people in the UK without basic digital skills by 2016. It is a huge but really important task. In order to make this a reality, all of us need to work together to focus on identifying the right tools and solutions to bring people, businesses and charities online; and on finding the resources to deliver those solutions. I’ve been lucky enough to see for myself some of the work being delivered by partners and to hear about the innovations that are being developed. Work with older people, dementia sufferers, small businesses and people with disabilities has been prominent among the examples I’ve come across. There is also some very exciting work afoot through the Connected Housing Initiative, which aims to provide improved and easier online access to social housing residents. Clearly, the challenge isn’t confined to any one particular group. In order to include everyone and to get real traction, the priority must be to find the right stimulus, the right bait to capture the imagination of people who are “hard to reach” for whatever reason. For many of our private sector partners, the bait for their customers is access to the service they provide or the merchandise they sell. For government, the ‘incentive’ it offers users is access to online services and benefits. For charities the impetus will come from the desire to reduce costs and increase the income available for good causes. For me one of the most compelling arguments in favour of digital inclusion is that it is an essential element of social inclusion. We must find the way to open the door to everybody. I recently visited a project in Birmingham where I chatted to people who were rebuilding their lives following periods of homelessness, mental illness, addiction and offending behaviour. Some of them could see the benefits of the digital agenda; for others, it seemed like a step too far, a step too intimidating. Digital inclusion needs to be made appealing for everyone, no matter how difficult that next step might seem for them initially. I know many of our partners share my ambition to see the UK become the most digitally inclusive nation. The work we now have underway on identifying specific routes into specific communities will be critical to our success. We are working with local skills providers, researchers within and outside government and with people who are making the transition online, to learn the lessons they are uncovering. I’d really like to encourage anyone who has something important to contribute to the debate to get in touch and share your ideas. I am immensely grateful for the patience shown by colleagues and partners who have generously shared their thinking and expertise with me over the last few months. Get Online week is a great opportunity to celebrate what is already underway and to look forward to what is just around the corner… more and better!